Attention Local 987 members aged 35 and under! The youth committee is made up of passionate young people – the future of the union – who are committed to building solidarity and awareness for Teamsters Union 987 in fresh and innovative ways. Young workers in Alberta today face many challenges – low wages, increasing costs for housing, food and transportation, a changing economy, the fear of lay-offs and rising unemployment. These youthful Teamsters Union 987 members are devoted to social justice and active in finding ways to create better lives for young workers. Their contributions are not only to the labour movement, but equally to their communities and workplaces. 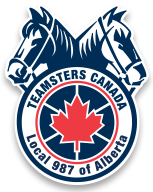 The 987 youth committee strives to build a brighter future today by creating a stronger community through engaging the next generation of Teamsters. We achieve this by raising awareness and recognizing that all members are equal and through solidarity, collective action works. Are you ready to join the movement of youth within Teamsters Union 987? Teamsters Local Union 987 Youth Committee is preparing and serving dinner for 250-300 in need individuals at the Edmonton Mustard Seed on Friday April 1, 2016. Youth Committee members volunteered time for the Salvation Army¹s Christmas Kettle program this past holiday season. TLU 987 Youth Committee has donated raffle proceeds to Edmonton’s iHuman youth outreach .